Before moving onto the new things, I had to photograph all the QAYG quilts I've recently made for my Craftsy class & magazines myself. They all do such a beautiful job, of course, but for me a quilt isn't finished when the binding is done or once it's been published. It's not until after we venture out to some nearby farm, field, bridge, forest, stream, or old wooden fence post, right here in Potter County, with that quilt and my camera in-hand until I feel contented and happy. I really hope you get that and don't mind seeing some of these one more time! It was worth it, for me at least, to take the time to do so. It's been awhile since my husband & kids helped me photograph a quilt. 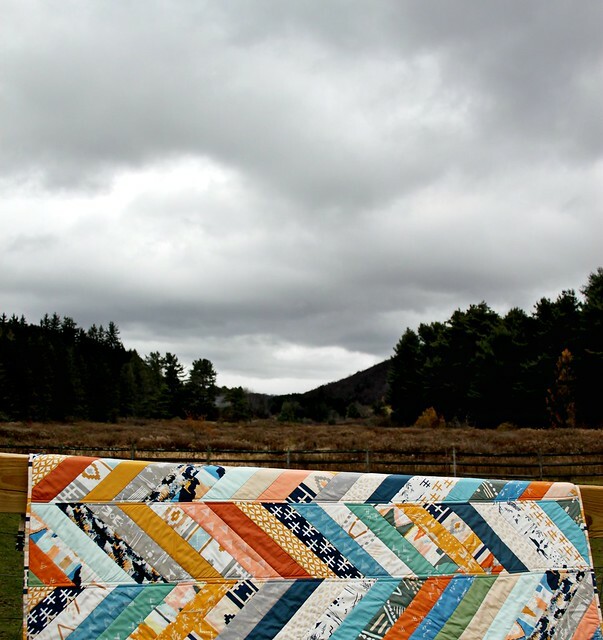 With this particular one, my Herringbone Lap Quilt in Bound, I was reminded what fun we have when we do, how special it feels, and how beautifully these quilts I make couple with home. 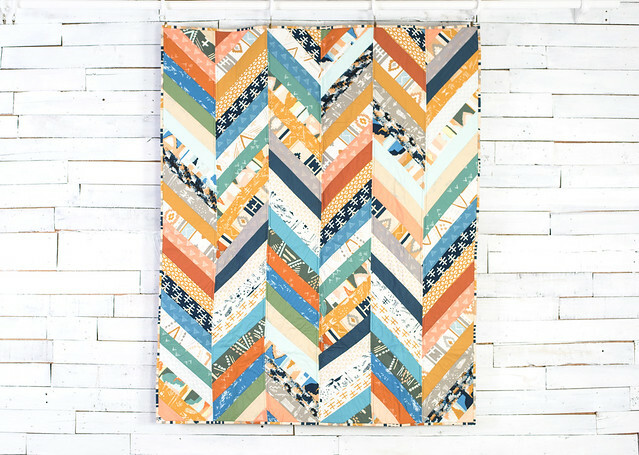 For those of you seeing this quilt for the first time, it's made using the Herringbone quilt as you go pattern I teach in my brand new Craftsy class, Quick Quilt As You, on sale here for the remainder of this month. 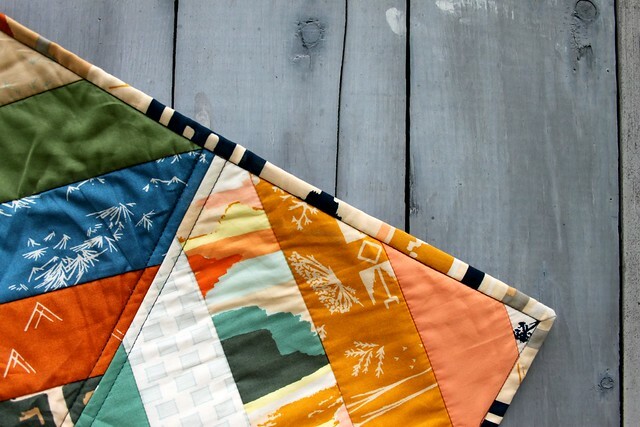 This is my very favorite quilt to make, it's incredibly fast and so much fun! I used April Rhodes' Bound collection for Art Gallery Fabrics with a mix of Pure Element solids and Prisma Element blenders. 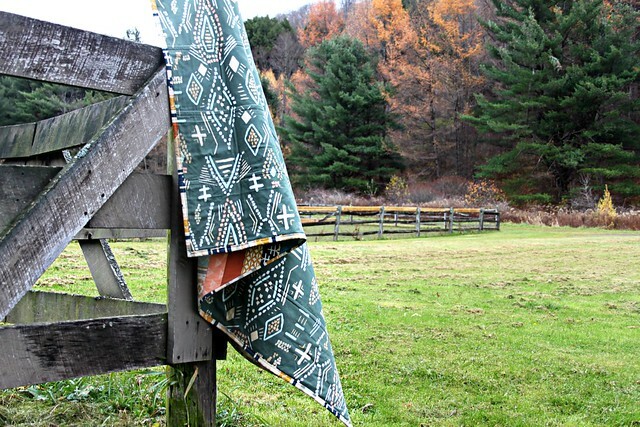 April's fabric designs match the landscape here so perfectly, it really is stunning! Even the backing fabric, her Macrame Cave print, with it's unique shade of green and brushstroke details, coordinate with the Autumn surroundings. So pretty! For the final, very minimal quilting I kept it all April Rhodes' using a navy Aurifil 50wt from her Arizona thread collection. For the binding I used the top print shown below, my personal favorite print from this collection, Bound Humanity. More and more I get asked about my particular method for machine quilt binding. I talk about it in my class, describing what I do, but since I don't demonstrate it completely I continue to receive questions. Before I put together a machine binding tutorial to share here, I thought I'd ask if any of you have or have seen a tutorial that already exists in blogland? 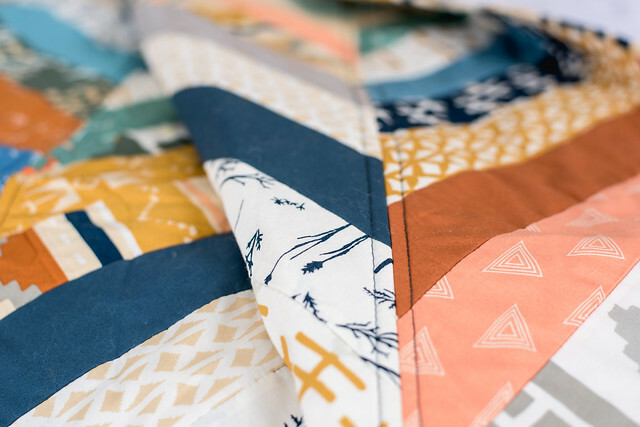 I'm looking to reference a how-to where the binding is attached to the front of the quilt first, folded (pressed) over, and to finish you stitch in the ditch from the front side catching the back edge of the binding? Let me know! 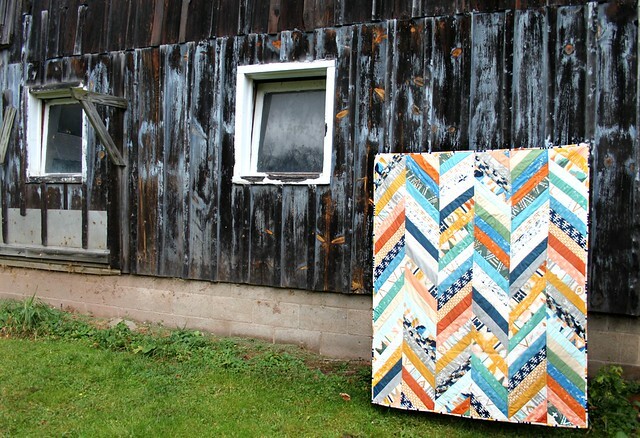 This quilt finishes at a 48" x 56." While I don't typically make quilts this size, I usually go to a 60" square at the very least, in making this I realized what a perfect single person quilt this is. It really is all you need! Making it a perfect quick pattern for gift-giving and donating! 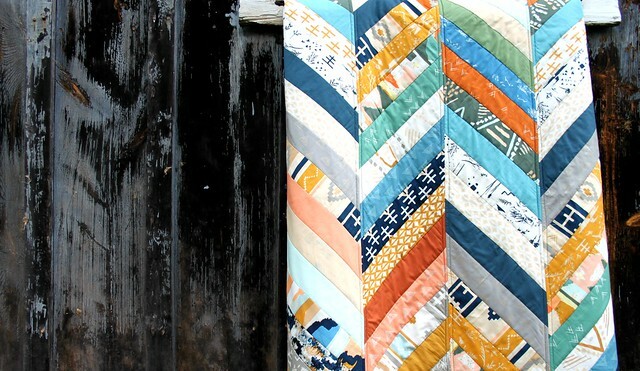 Tomorrow I'll be back with another QAYG quilt photoshoot to share, be sure to stop back! That is really beautiful. I love seeing it in those settings. It truly is special to me, to be able to share them photographed in this place that I love so much. Thank you! Rita from redpepperquilts.com has a great tutorial on binding where you attach to the back then fold over and stitch in the ditch. I don't have the link handy, but I'm sure it wouldn't be hard to find! Somehow, amazingly enough since I happen to be a huge RPQ fan, I don't recall ever seeing her method before. Mine evolved from Cluck Cluck Sews method. Just a few differences -- I do cut my strips to 2.5" still, I do not zig zag the two outside edges of the binding together, I do not pin, and I press over the binding well to the back of the quilt, overlapping the stitching line made when sewing the binding to the front of the quilt. I think ironing here really helps get a nice crisp binding. Thanks!! Maureen, Red Pepper Quilts covers the binding method you mentioned on her blogspot and Crazy Mom quilts has a great tutorial on binding corners. It is Part Three of a three-part tutorial. Thank you! I will be sure to check it out. Please be sure to share your class projects with me, thank you for joining in, I can't wait to see! They are all so beautiful. I've been thinking about photographing my work. But in a large metropolitan area, I guess the only place would be the block wall in the yard, yuck. Any other suggestions. I'd really would love to have pictures of them before I give them away. Yes, that's the tutorial I used to reference and then it started getting pointed out to me the difference, she sews right along the edge of the binding from the back side, sewing to the left of the seam line, creating a straight stitch line on the front of the quilt. Where I stitch in the ditch from the front side of the quilt, catching the edge of the binding on the back side. 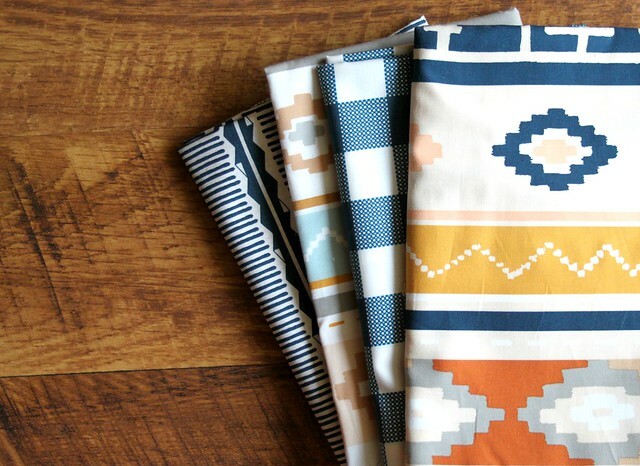 Just bought the class, I can't wait to sew along with you! Beautiful quilt! The Fat Quarter Shop has a great YouTube video of machine binding! Yes, I started with the red pepper quilt binding method as well. I always had trouble catching all the binding. I wonder if your pressing trick would help. In the meantime I just went to a zig zag stitch, and haven't had any problems since. It is a bit more visible, but I don't think it detracts from everyday quilts. Lovely in every way. I'm definitely going to take your class - some day! - I still can't wrap my brain around all aspects of QAYG, and would like to learn how to do it. But I need to be in a place where I don't have so many pressing and pending projects as I do right now. That time will come!